Asher inside every surfer's dream. Parked under a beautiful slice of Indian Ocean. The spectacular view at Borobudur, a 9th-century Mahayana Buddhist Temple in Magelang caps off another day. Asher up in the mountains of West Java. Asher drives through a Desert chamber. Asher shows he's just as versatile on some conventional equipment. Take an expedition through Indonesia with one of the most traveled surfers on the planet. Asher Pacey has formulated a successful career as a freesurfer, carving out niches where others can't and doesn't fit comfortably into cliched surfing boxes. The resurgence of the twin fin can be attributed in part to surfers like Asher, who riff on them with swagger and grace. 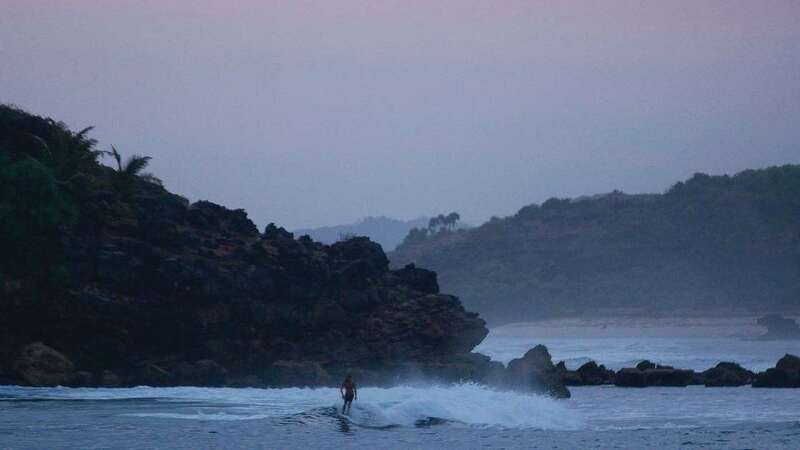 He also happens to be one of the most traveled surfers on the planet, sojourning to one tropical location after another while the likes of us look on with envy. Most recently he linked up with TRVL surf - a company that specialises in surf travel - where he surfed his way through Indonesia, taking in five islands in seven days as part of one of their expeditions. "What an adventure it was ... personally it was one of my most memorable trips. We visited five islands in seven days, surfed some incredible waves, saw old friends and made many new ones along the way. We experienced everything from crowded surf spots that were not so long ago relatively empty to lineups void of the mass crowds, pristine and untouched. Although it was primarily a surf trip it was so much more than that. Towards the end of the week we took a detour off the coast deep into Central Java to visit Borobudur, a 9th-century Mahayana Buddhist Temple in Magelang. It is believed to be the greatest Buddhist monument in the world. I felt incredibly fortunate to see the sun go down over its walls on a clear sky day and watch the full moon rise over volcano, Mount Merapi. The sights, sounds, smells, interactions and feelings that come with travel are forever priceless." If you're planning your next surf adventure check out TRVL surf or give them a follow on Instagram and Facebook.